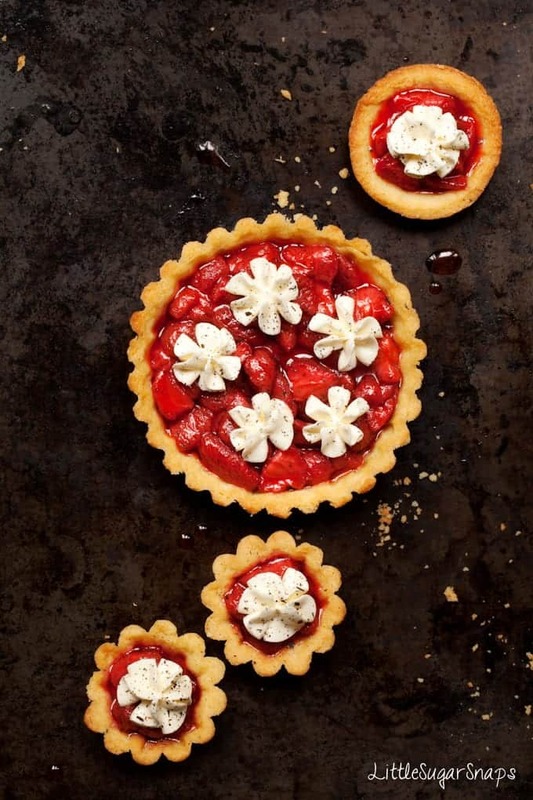 Strawberry tarts. Simple, summery and cheekily colourful. 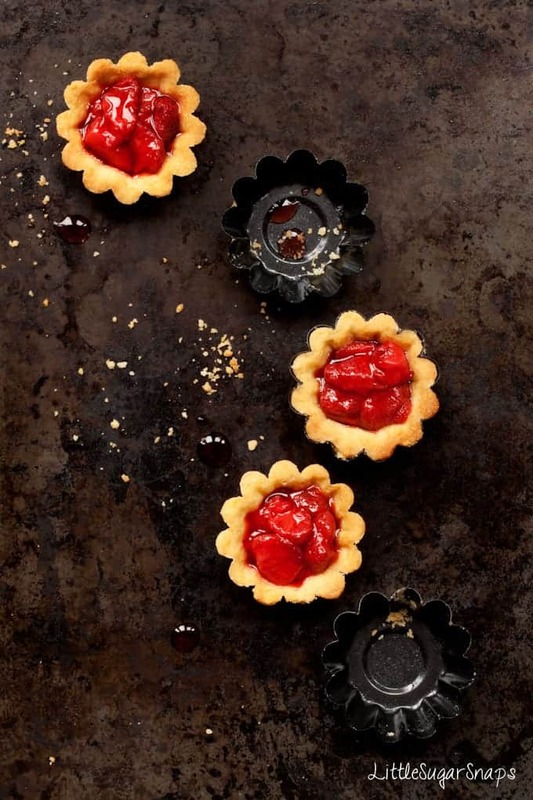 These tarts are your saviours when you want something fancy to serve to guests but don’t want to be faffing around in the kitchen as they arrive. When it comes to summertime entertaining, I hate to be messing around for too long in the kitchen whilst guests are enjoying the good weather outside. 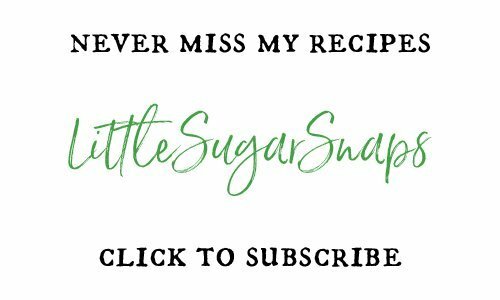 With this in mind, I have some perfect little Strawberry Tarts to tempt you with this week. The pastry is make ahead. The filling is make ahead. So when it comes to time with friends (and sunshine) all these little gems require is just 5 minutes of your precious time right before serving. 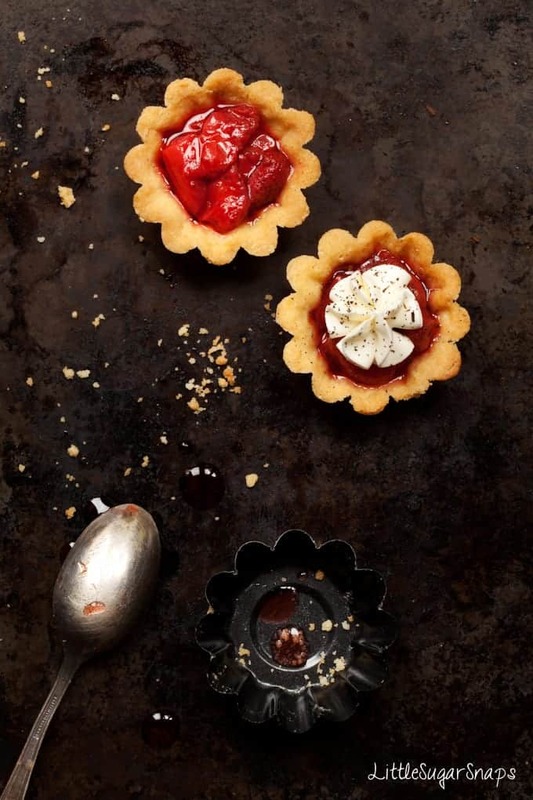 At the heart of these Strawberry Tarts is my Roasted Strawberry Sauce. Thick, punchy and vibrant, this sauce is the ideal accomplice to crisp pastry shells. The pastry is light, crunchy and deliciously sweet. It pairs so very well with the fresh taste of summer strawberries. A delicate garnish of cream is really all this tart needs to be dressed for dinner. 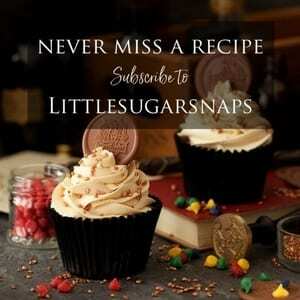 And bonus: I have a confession and a baking tip to share with you. The confession comes about because I’ve always struggled to keep my pastry shells looking neat and tidy after I have blind baked them. Since one of my traits is being a perfectionist, messy pastry cases really irritate me. I cannot stress that enough. Erghhhh. I wasn’t feeling confident when I started to bake these Strawberry Tarts, so I decided to sit down whilst the pastry was resting and Google a solution to my er… ungainly pastry cases. 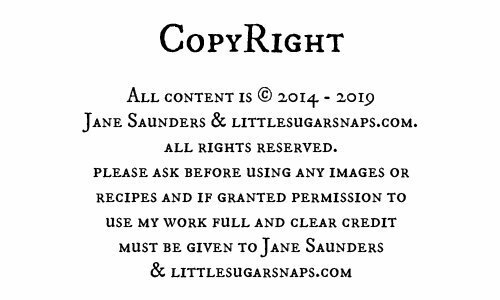 Mostly, I came up with all of the usual suggestions – chill, line with parchment or foil, fill with rice or beans or baking beans. I was getting stumped. And then suddenly I hit upon a suggestion I’d not heard of before: cling film. My first thoughts were rather negative. I did expect it to melt into the pastry during cooking and just render everything inedible. So I googled some more and found numerous people all suggesting the same technique. There was only one condition: I must use quality cling film. Confession: I have quality cling film in my kitchen cupboard because (oh the shame) my Mother bought me some for Christmas last year. It comes in a neat little cling film dispenser. Back to the cling film (yes, the one in the Mummy dispenser). The brand is Bacofoil and only Bacofoil cling film fits in this little dispenser of mine (I have tried supermarket brands – they don’t quite fit). I consider Bacofoil cling film quality enough for anybody. I approached my blind baking with cling film experiment cautiously. 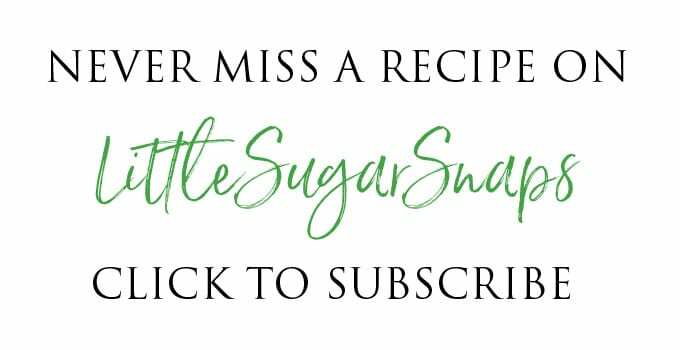 Well, ok, for the first couple of pastry cases I cautiously tried to avoid any cling film touching my baking pans, but then I lost patience and stopped fiddling about and it did touch my pans. That’s just me. Into the oven my tarts went, to return 10 minutes later with cling film that had miraculously not welded itself onto the tin or the pastry. Hurrah. It lifted up easily and the tart cases were far neater than I have previously ended up with. I consider that a success. I’ve heard it said plenty of times that pastry is an art and that is so true. Previously my pastry has always tasted far better than looks would suggest. I suppose that’s better than the other way around. But starting with these Strawberry Tarts, and armed with my trusty cling film dispenser, I’m planning on racking up at least a bronze medal on the pastry beauty stakes from now on. 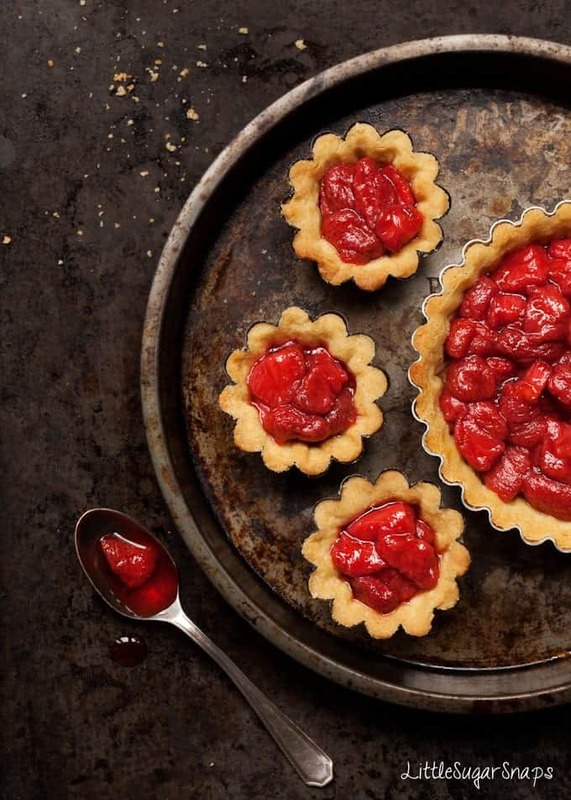 To make these Strawberry Tarts, you’ll need the recipe for my Roasted Strawberry Sauce which I divised in support of the campaign #forfoodagainsthunger – click through for details. Wow, these are so pretty! I love the shape of the tarts, they are like flowers! Love these tiny treats for a end of summer party! Thanks Jennifer. The end of summer is sad but also good because… Autumn food is on it’s way.